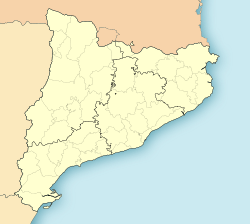 Hostalric is a veelage in the province o Girona an autonomous commonty o Catalonie, Spain. The municipality covers a aurie o 3.39 square kilometres (1.31 sq mi) an as o 2011 haed a population o 4030 fowk. Parish church of Santa Maria in Hostalric, Spain. Placit at the fuithills o the castle hillock, the kirk o Santa Maria wis first mentioned in 1217. Thare are nae remains o the oreeginal temple, which wis enlairgit at the end o the 14t an the middle o the 15t hunderyears. The present biggin, which reteens a gothic air, wis built atween the end o the 16t hunderyear an the first quairter o the 17t hunderyear. It consists on ane nave an polygonal chancel, chapels atween buttresses an groin vault. On the ootside, the staundin featurs are the renaissance an baroque decoration o the facade an the bell touer, wi square floor-plan, constructit aroond 1620 bi Master Bernat N. de Mataró. The kirk wis plundered an burned doun in 1809, durin the Unthirldom War an in 1936, at the beginnin o the Spainyie Ceevil War. The castle is built on a basalt hill an records o it date back tae the twalth hunderyear. Its importance grew acause o its strategic position, controllin the Ryal Way (Cami Ral) atween Barcelona an Girona, an the fact that Hostalric became the admeenistrative caipital o the viscoontcy o Cabrera. It wis the scene o numerous battles in mediaeval times an the auld castle virtually disappeared as a result. The oreeginal design for the modren fortress wis the wirk o Francisco de Santa Cruz, a militar ingineer in the service o the Airchduke Charles. Work on the construction of the fortress we see the day wis completit atween 1794 and 1795 an it became a important point o resistance against Napoleon's airmy durin the Peninsular War (1810-1814). In 1929 the castle's garrison wis transferred an Hostalric ceased tae be o militar significance. In 1963 the castle an the toun's waws an touers wur declared a Cultural Steid o Naitional Interest.